I do like a change. Although I really enjoy spinning for perch, chub and other predatory fish I'm long enough in the tooth to know that if you want to catch more and bigger fish then there's no substitute for the real thing as bait. 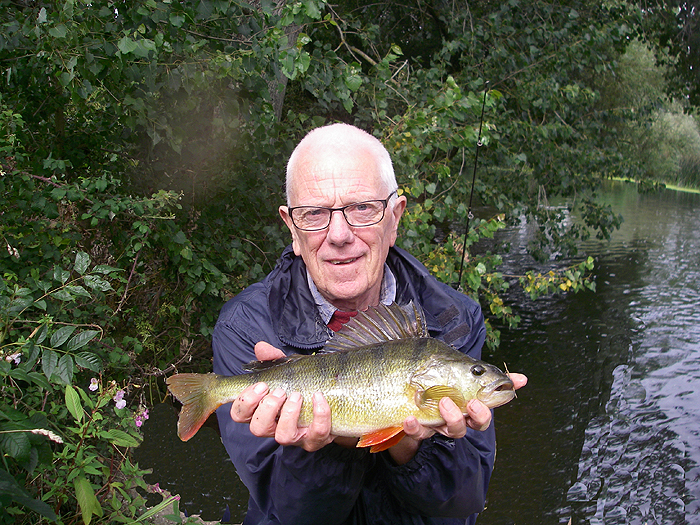 After catching perch on lures the other day I decided that I fancied trying for them with live fish. I used the tactics that I've employed before - a simple paternoster with a small (5g) weight and a dropper of knottable wire with a size 6 circle hook. When the gear settles on the river bed the hook must be virtually on the bottom. The first problem is catching bait. I normally take a second rod with light float tackle and fish single maggot for minnows etc.which I keep in a bucket. My first problem was roach. All I could catch was roach too large for perch baits. After the first half dozen I moved to another spot where I could see minnows and proceeded to catch a dozen or so sizeable minnows plus a couple of 10cm dace - all suitable baits. I liphooked a minnow and swung it out. 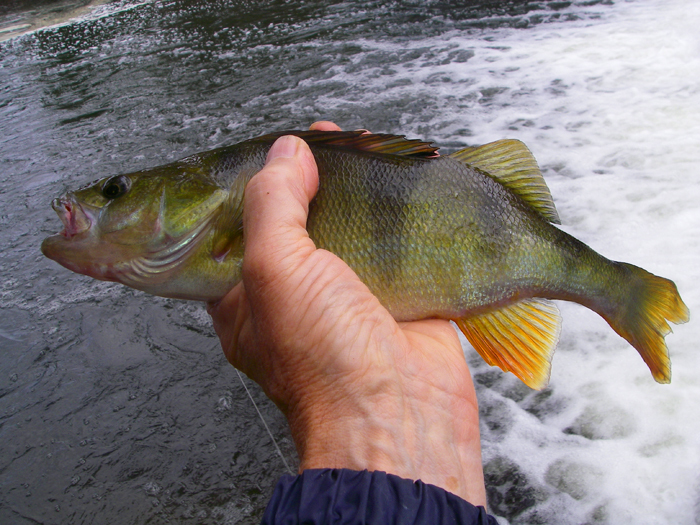 As it hit the bottom I could feel the tap tap of a perch and as I tightened the rod bent to show that I had a customer. It was tiny, only about 50g or so. Anyway it was a start. next cast was a repeat except that on the way in the rod suddenly crashed over as a pike took the hooked perch. Of course the pike wasn't hooked so after a few seconds it came unstuck taking the perch with it. Next cast same again but this time the pike wrapped me into a sunken tree before letting go of the perch. I rigged up a new paternoster and began again. The next perch was a reasonable size - perhaps 500g (just over a pound) in weight so I was encouraged. I hooked on my biggest dace and sure enough this time I could feel that the fish was much heavier. Was it a pike? No, I could feel the tell-tale thumping fight of a perch and soon I saw the green, black barred flank of a fine perch turning this way and that as I reeled in. This one weighed about one kilogram - wonderful. Perhaps I should have hung on to the big roach for bait? I asked a youngster who had stopped to watch if she would take a picture with my camera and she did. That fish was the biggest of the session but I had several more good fish. The pike showed up a couple more times but I managed to avoid it taking any of the hooked fish. All in all an excellent session to say it was mid-afternoon on a bright sunny day.